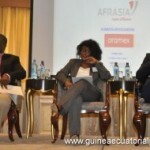 A representation of the Equatorial Guinean National Agency for Horizon 2020 participated in the WCA Africa Investments Summit & Ceo Forum 2013, to report on the benefits of investing in Equatorial Guinea. the center, during her presentation. On November 4, a delegation from the Equatorial Guinean National Agency for Horizon 2020, led by Maria del Mar Bonkanka Tabares, Counselor of Economic Affairs and Communications, went to Nairobi (Kenya) to participate in the “WCA Africa Investments Summit & Ceo Forum 2013”, held between November 4 and 9. Bonkanka Tabares was accompanied by Constantina Bindang Ndong Okiri and Ilidio Mebulo Mohete. The Equatorial Guinean delegation was invited by the prestigious Wharton Club of Africa and Simba Group Ltd, to make a presentation about our country and its business opportunities. The conference was structured over the three days in various thematic panels. 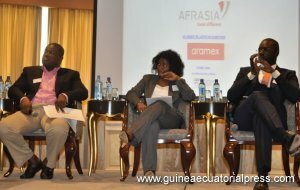 The Counselor of Economy and Communication of the Equatorial Guinean Agency for Horizon 2020 participated in the panel of West African countries, with a presentation on Equatorial Guinea, and the advantages of investing in our country. During her speech, the counselor informed all the investors of the existence of our country and the intention of Equatorial Guinea to reach the emergence by 2020. She also conveyed information about the Symposium on Diversification of the Sources of Economic Growth for an emergent Equatorial Guinea, to be held between February 3 and 4 in Malabo, and invited all the attendees to participate. Japan, the world’s largest buyer of liquefied natural gas, received a spot cargo from Equatorial Guinea today, according to ship-tracking data. The Gaslog Shanghai, with a capacity of 155,000 cubic meters, docked at Tokyo Electric Power Co.’s Ohgishima terminal in eastern Japan, transmissions captured by IHS Fairplay on Bloomberg show. It loaded the supercooled gas at Equatorial Guinea LNG Holdings Ltd.’s Punta Europa facility and departed Oct. 25. The Ohgishima plant has a capacity of about 14.3 million metric tons a year, according to data compiled by Bloomberg. It receives long-term shipments from Indonesia, Malaysia, Australia, Qatar, Oman, Brunei, Abu Dhabi and Russia. Asian LNG buyers typically import spot cargoes from December to March to meet peak heating and power demand during winter in the northern hemisphere. Tokyo Electric, known as Tepco, is seeking two shipments for delivery in February and March, two people with knowledge of the matter said yesterday. Employees from the Ministry of Foreign Affairs of the Republic of Equatorial Guinea are attending training courses on public diplomacy at the China Foreign Affairs University in Beijing. They spoke with CRI’s reporters about their experiences in China on 20 November. With China now the biggest investor in Equatorial Guinea, taking over half of their market shares, they believe these courses will enable them to better understand China’s oversea investments and Africa-related policies. This, they said, will promote communication and cooperation in financial, economic, cultural and diplomatic sectors between the two countries. They now also have also the opportunity to learn about Chinese cultures, especially concerning the ethnic minorities policies of the government. They hope to introduce Chinese culture to the Equatorial Guinean people after returning to their home country. The courses on public diplomacy were established in 1996 at the China Foreign Affairs University. The university started off with around 20 students enrolled, holding one semester a year. The number has climbed to over 300 and dozens of semesters a year. The training, including lectures and site visits, provides a platform for diplomats from developing countries to access China’s policies and cultures, the university said. 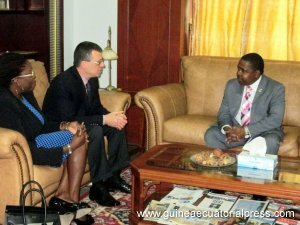 The Prime Minister of the Government for Administrative Coordination of Equatorial Guinea, Vicente Ehate Tomi, received in his office in the headquarters of the Presidency of the Government the representatives of the World Bank for Central Africa and Equatorial Guinea, Gregor Binkert and Zouera Youssoufou. 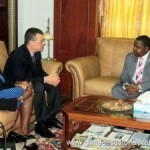 The audience of the Prime Minister had the intention of dealing with the new actions of collaboration that the World Bank will provide to Equatorial Guinea; collaboration that will include, from the training of human resources in the sectors of education, healthcare and social protection, to the accompaniment of the Government of Equatorial Guinea in the country’s industrialization plan. Especially important was the theme of the diversification of the economy, which precisely will be the subject of a conference that will be celebrated in February, 2014, with the purpose of attracting businessmen to invest in our country. In fact, among the subjects discussed was the form in which the World Bank can help to achieve this objective: “We are willing to respond to the demand of the Government, which is also appreciating our contribution”, said Gregor Binkert. Malabo — For close to two decades now, oil money has been flowing into Equatorial Guinea’s economy, but hopes that poverty could soon be history have not been fulfilled. The country’s president rules with an iron hand. The transformation of the small traditional food industry of our country into international industry will be the focus of the company Cunovesa Guinea Ecuatorial, dedicated to food engineering. 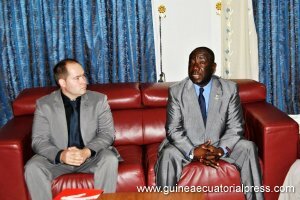 The President of the Chamber of Commerce of Bioko, Gregorio Boho Camo, has congratulated the decision of the company Cunovesa Guinea Ecuatorial, which is already established in our country and will provide motivation to farmers, since we have fertile ground for the production of cocoa and other crops. Its presentation was held at the headquarters of the chamber, and is expected that within six months, the consumption of chocolate produced in Equatorial Guinea will be possible, and will begin to be marketed abroad, as stated by the director of the firm Jose Novellas Sala, who was accompanied by the commercial director, Francesc Ventura Amoros and Angel Custodio Saga, a partner of the company. This initiative will contribute to the Government’s plan for the industrialization of Equatorial Guinea, in view of Horizon 2020. 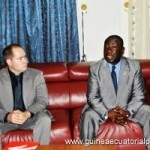 The President of the Chamber of Commerce of Bioko, Gregorio Boho Camo, along with the Vice President, Antonio Mete Chicampo, received on Friday, September 13, in his office of the headquarters of the institution, the president of the American Chamber of Commerce and president of the oil company Exxon Mobil, David Findley. The objective of the audience was to plan and relaunch the activities between the Chambers of Commerce of Equatorial Guinea and the United States, in collaboration with the small and medium companies in Equatorial Guinea. During the meeting, they also discussed the strengthening of the relations of the two Chambers of Commerce and the possibility of identifying primary sectors of cooperation. The American Chamber of Commerce was also registered in the Chamber of Commerce of our country, in order to establish bilateral cooperation. Gregorio Boho Camo, in addition to congratulating his counterpart in the position, David Findley, he also stressed the mutual participation of American companies with the Equatoguineans in the development of our country. Siem Offshore and Capricorn Exploration and Development Company Limited & Nautical Petroleum Limited have entered into a contract for the AHTS vessel Siem Aquamarine for operations offshore Morocco. The charter contract is a firm period of four wells and charterer has an option to extend the charter contract for 4 additional wells. Siem Offshore and Hess Equatorial Guinea INC have entered into a contract for the PSV Sophie Siem for operations offshore Equatorial Guinea. The charter contract is for a firm period of 18 months and Hess has an option to extend the charter contract by 2 x 3 months. The contracts commence in the third quarter 2013 and the gross value for the firm period of the two contracts is US$23 million. The president of the Chamber of Commerce, Agriculture and Forestry of the Island of Bioko, Gregorio Boho Camo, received in his office a delegation of businessmen from the Italian region of Marche. Amadeo Ciccarelli led the Italian business delegation which met with Boho Camo on August 21 to present a cooperation agreement between the chambers of commerce of Equatorial Guinea and the Marche region. Also, the delegation was interested in participating in the program of industrialization of Equatorial Guinea 2020. For his part, Gregorio Boho Camo thanked the intention to invest in our country, and said that Equatorial Guinea is always ready to welcome any investor that complies with the applicable laws.